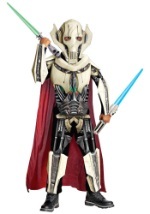 Go for an animated Star Wars Halloween costume look with our child and adult Clone Wars costumes from the TV series. Discover new characters, like Ahsoka Tano, Anakin's Padawan, and Asajj Ventress, Count Dooku's personal assassin. Available in many styles and small, medium or large child and adult sizes, your Star Wars Clone Wars costume will make those you battle consider switching sides.